Liverpool to make winter move for Hazard? 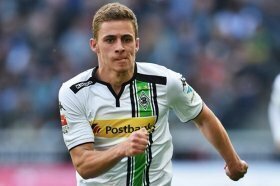 Liverpool boss Jurgen Klopp is reportedly keen on lodging a winter attempt to sign Thorgan Hazard from Borussia Monchengladbach. The Belgium international, who is the younger sibling of Chelsea's Eden Hazard, has been in splendid form for Monchengladbach this term with 12 goals and nine assists across all competitions. As such, he has been regularly linked with a big-club move elsewhere and according to The Star, the Reds could make an offer in the region of £31m to prise him away from the Bundesliga outfit. It is added that Klopp would thereafter be prepared to loan Thorgan to Monchengladbach for the rest of the season with the German side setting their ambition of finishing in the top four this term. Meanwhile, the Merseyside outfit are looking into potential options to bolster the heart of the backline with Joel Matip and Joe Gomez on the sidelines for extended periods. The Reds are currently with just two central defenders in the form of Virgil van Dijk and Dejan Lovren for the festive schedule of fixtures where they have the task of preserving their Premier League lead.